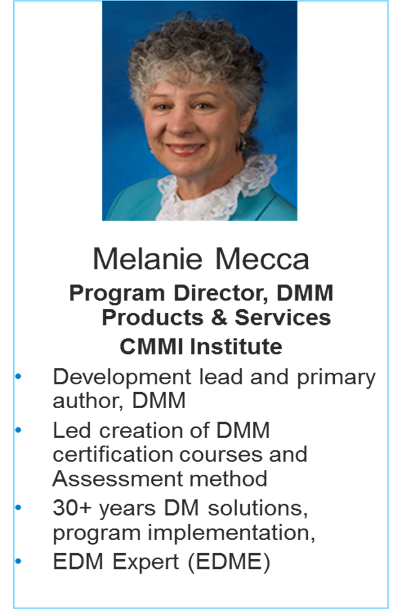 The DMM (Data Management Maturity Model) was created by the DMM group within the CMMI Institute (Capability Maturity Model Integration). The CMMI Institute helps organizations discover the true value they can deliver by building capabilities in their people and processes. The CMMI Institute is the global leader in the advancement of best practices in people, process and technology. An educational presentation about the DMM (Data Management Maturity Model) , a reference model of capability growth in data management, and its use to organizations in developing a strong well organized enterprise data management program aligned with the business strategy. The workshop will feature case studies and a hands-on experience with evaluating capabilities, as well as demonstrating that data architects are well-positioned for valuable roles in enterprise-wide data management based on their internalized knowledge. The workshop is hands-on, everyone will come away with an understanding of how to use a data maturity model, and an immediately useful template to implement in their organization. March 15th 9:00 a.m. - 12:00 p.m.